Learning to grocery shop on a budget is important, but it is especially essential around the holidays. Doing so is one of the best and easiest ways to pinch pennies, and help to ease you through the months ahead. It can be difficult. Rising food costs, combined with smart marketing can leave the most seasoned shoppers scratching their heads. However, it is possible to save, and you can take the upper hand. As you grocery shop this holiday season be proactive by having a shopping strategy in place. You will be pleasantly surprised how much money you can save. Here are 7 tips to get the most ‘bang for your buck’ this holiday season. Plan ahead for your holiday meals now, and buy what you can gradually, each week. This way, you will have what you want in the pantry or freezer for Christmas Eve, or Christmas Day, and over the New Year’s holiday without spending an entire paycheck on groceries two days before Christmas. This is always a good habit, but a particularly good one around the holidays. A shopping list helps you stay focused and only buy what you need. Even better if you know the store layout, you can go directly where you need to. You will spend less time browsing and impulse buying other items not on your list. Impulse buys will increase your spending by 20% to 30% on average. A shopping list will help you find exactly what you need, cash out, and leave the store quickly. With all the flyers sent out during the holiday season, coupons are everywhere. Use them! All the advice about taking advantage of coupons is true, they will save you money. Even though the savings per coupon may be small, it will add up—$10, $15, or even $20 a week in savings can be realized. The key is to use coupons whenever you can, but only on the groceries or other items that you actually use. Cut coupons in conjunction with you shopping list. Otherwise, using coupons to impulse buy on items you don’t use is only costing you money. This is especially true during the holiday season. With all the goodies available in grocery stores during the holidays the best way to avoid temptation is to never go grocery shopping on an empty stomach. Shopping hungry can cause excess or impulse buying, and will surely increase your grocery budget on unnecessary items. If you are hungry, have a snack before you go. 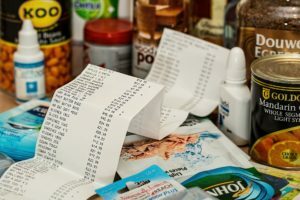 Once you have established a weekly food budget, pay only in cash for your groceries. Start by bringing only that amount of cash with you to the grocery store. If your budget is $75, place that in an envelope and nothing more. You won’t be able to spend beyond your budget if you don’t have the money on you. It will also help you maintain your self-discipline in budgeting. Stores push the items they want you to buy at eye level. Those are the items with the highest profit margins, though they may not be the highest priced items. Stocking the aisle and shelf displays with high profit margin items at eye level is good for the store, but not necessarily your wallet. Therefore, always compare prices. Look for better prices on the upper or lower shelves first before making your selection. In each aisle, each shelf may have potential savings. No doubt that prepackaged and prepared foods can be a time saver, but they are also costly. For example, avoid the pre-cut vegetables, deli chicken, or cheese trays. Though convenient, you get less quantity and therefore, less for your money compared to non-prepared items. Get in the habit of making your own meals with basic ingredients, or even from scratch. You’ll save money this way and actually may discover that the food tastes a lot better. Learning to grocery shop with a budget can mean big savings for you. Having a plan in place before you enter a grocery store is important. Using some of these simple tricks outlined here will help you develop a shopping strategy that you can carry forward after the holiday season. With a strategy in place, the less time spent in the grocery store, the less you spend, and the more you save.